Police are warning residents of eastern Pacifica to be aware when outdoors after a resident reported seeing a mountain lion Wednesday night, police said. Officers received a report at 8:30 p.m. of a mountain in the backyard of a home in the 700 block of Big Bend Drive, near FrontierLand Park. The person who reported the mountain lion told officers that the lion was last seen jumping a fence into an adjacent yard, according to police. The person videoed the cat, which appeared to be a 5- to 6-foot-long adult, police said. Officers checked the yards of numerous homes but did not find it. Police said officials with the California Department of Fish and Wildlife were notified. It's rare for a mountain lion to approach a human, but in case one does, people can follow some tips to stay safe, police said. Do not feed deer, which attract mountain lions. It's illegal in California, according to police. Do not approach a mountain lion, especially one that is feeding or with its offspring. Avoid hiking in wooded areas at dawn, dusk or night when mountain lions are most active. Watch children closely when hiking or traveling near or in wooded areas and pick up small children if a mountain lion is encountered. Anyone who encounters one should face the cat, make noise, try to look larger by waving their arms and throw rocks or other objects. Also, keep all pets and pet food indoors at night because even the largest domestic dogs and cats can be mountain lion prey. 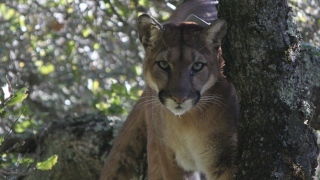 More information on mountain lions can be found at www.wildlife.ca.gov/keep-me-wild.